The Computing and Mathematical Sciences (CMS) Department launched a new CMS Partners Program this year. It provides opportunities for individuals, start-ups, and companies to engage with CMS faculty, researchers, and students in order to strengthen academic–industry ties and initiate research collaboration. The Partners Program provides ways for companies to meaningfully engage with undergraduate and graduate students through course projects, collaborative research, and mentorship. The program encourages members to actively engage with students and faculty through a variety of channels, including TechFest, the annual Meeting of the Minds event, student clubs, and events such as Hacktech, Caltech’s coding competition for high school and college students. To learn more and get involved with the CMS Partners Program, visit www.cms.caltech.edu/outreach/partners_program. The Caltech Robotics Team took first place at the 2016 International RoboSub Competition. 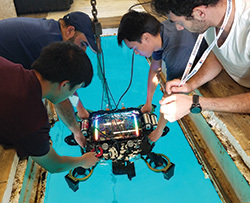 The team’s robot, nicknamed Dory, successfully navigated an obstacle course with tasks that required it to touch buoys, fire torpedoes at targets, and rescue an object under water—all autonomously. Dory has seven thrusters, two grippers, a hydrophone, and other sensors. She took nine months and about $75,000 to build. 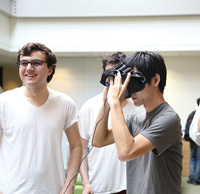 This was the third year Caltech undergraduates entered the competition. In the first year, they placed seventh out of 39 teams, winning the “best newcomer” award. The following year, the team’s ranking climbed to fourth out of 37. This year they came in first out of 47 competitors from around the world. It is noteworthy that, each year, the team has chosen to build the sub from the ground up—even though teams are allowed to re-enter subs, tweaking them to build on past successes. Watch a video of the team in action at www.robonation.org/competition/robosub. The Center for Autonomous Systems and Technologies (CAST) was recently established at Caltech to promote interdisciplinary research and the exchange of ideas in the exploding area of autonomous systems. 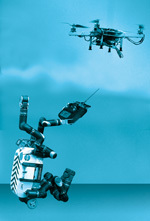 These systems include drones and robots for use in science, industry, and medicine. The research conducted by the center addresses sensing, control, vision, and other emerging areas. The center also promotes a synergic environment where machines and humans share the workplace. In addition, it serves as an arena for ideas to translate into reality and be demonstrated to academic researchers as well as to the general public through educational outreach. This center was funded through the generous support of Foster and Coco Stanback. For information about ways to get involved, contact cast[at]caltech.edu. 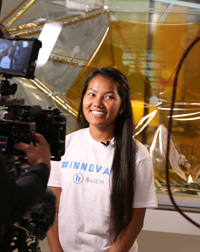 Students and faculty from the Graduate Aerospace Laboratories of the California Institute of Technology (GALCIT) have been partnering with a workforce and entrepreneur accelerator called Base 11 to help create the next generation of leaders in STEM (science, technology, engineering, and mathematics). The program brings together GALCIT students and high-potential, low-resource community college students who have expressed interest in aerospace engineering. During the fellowship, the Base 11 students receive mentoring, attend conferences and lectures, and participate in GALCIT research projects. One such student was Alina Rai, who was mentored by Professor Beverley J. McKeon and her graduate student David Huynh. Rai worked on a drag-reduction experiment focusing on flow-induced motions of elastic gelatin membranes. She had the opportunity to build an experiment from the ground up and experience the challenges and thrills of aerospace research. Learn more by watching this video: bit.ly/2aUL6cW.